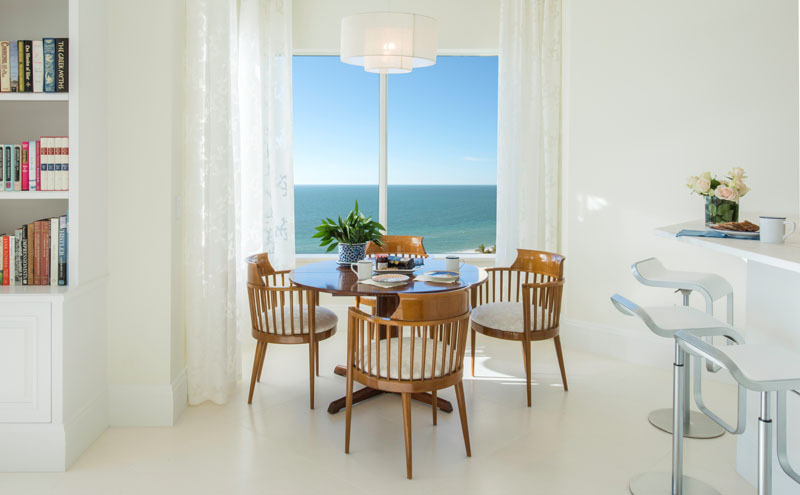 “Like living in a cloud” is how guests describe this beautiful, bright aerie on the Gulf of Mexico. 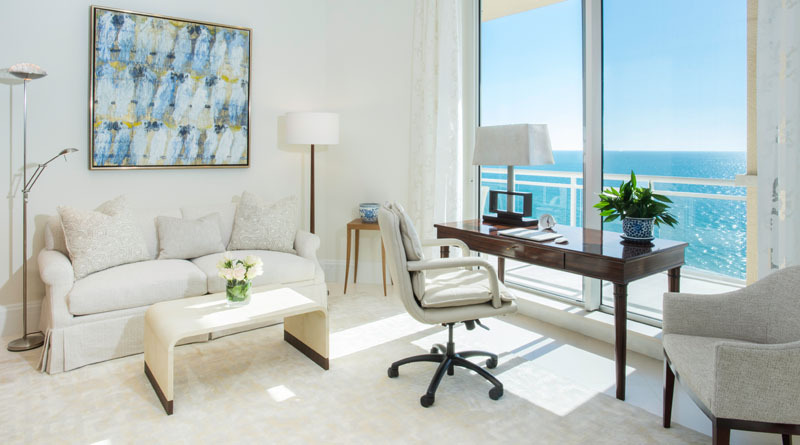 Designed to maximize the effect of the gorgeous sky, brilliant water and bright sand, this sumptuous penthouse in a very desirable building in Sarasota, Florida, has a clean, clear and very, very white palette. Setting the background was the first step to creating drama and to making the most of the view outside. Painting walls, ceiling and trim with Benjamin Moore’s Pure White paint set the tone. 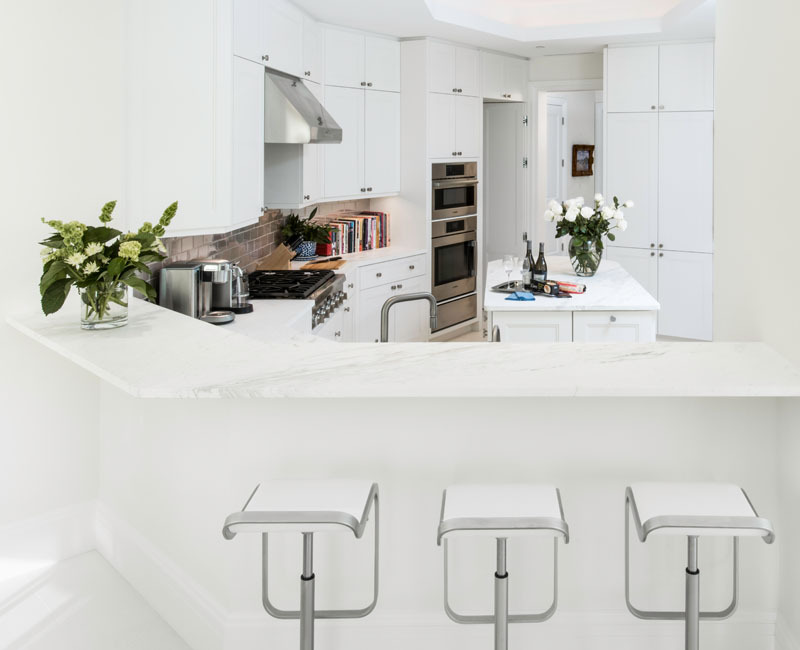 A pristine, white French limestone, in 36” blocks, covers the floor, completing the all-white canvas upon which to design. Softening the glass doors, which comprise the entire western wall of the space, are unlined, sheer stationary panels in a white abstract “burnt-out” pattern. 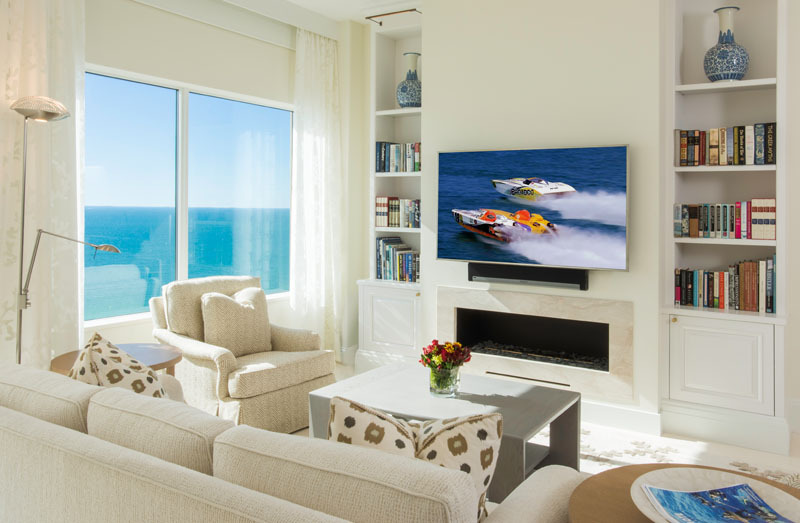 Furniture is sculptural and kept to a minimum without sacrificing comfort or beauty or distracting from the incredible view. Wood and iron tables are sculptural and read like modern forms. 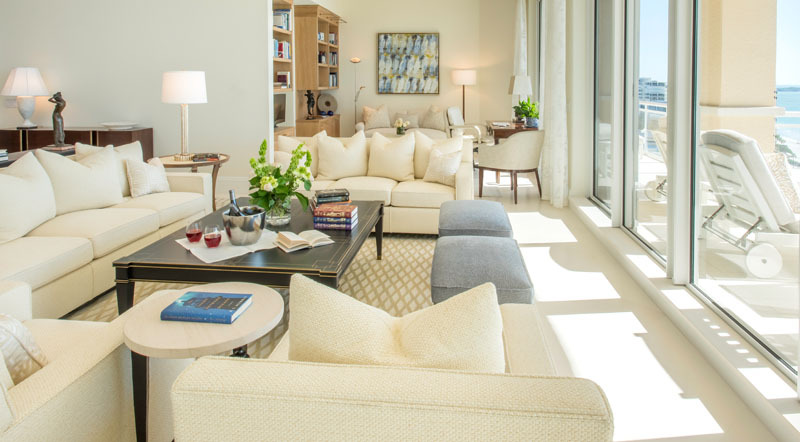 Upholstery is simple and modern, with interest found in ivory colored textured fabrics, all with unique and interesting weaves. The closer one looks, the more intertwined the design becomes. Here and there, an antique or mid-century piece is found, adding variety and a sense of history and collecting. Once again, soft ivories are found in fabrics and carpet in the master bedroom, creating the most soothing and calming of interiors. Wood pieces add interest but are uncomplicated and functional. 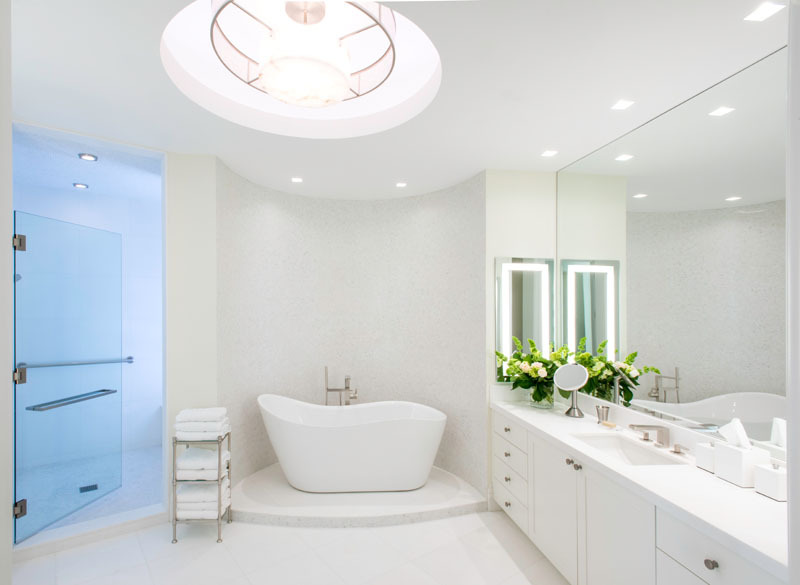 The brightness of the white is carried into the master bath with a sensuous, sculptural tub and a custom designed alabaster light fixture. The stone is Thassos, with an even crystalline surface that glitters gently with a bit of light. Thassos mosaic tiles cover all the shower walls, keeping the whiteness and brightness but adding an ancient texture. Everything in this fabulous, ethereal design emphasizes the incredible view while providing ultimate and luxurious comfort and serenity. Truly, an aerie in the sky- like a floating white cloud. or on her cell: 703 362 0532.